Ethx ICO has started on 1st of July 2018 on Sunday. Ethx is now getting big for global from India. So, Ethx.in has renamed to Ethx.co. On 15th June 2018, the Secure Wallet was launched, users around the globe can store their assets by using this wallet. As mentioned early that the ETHX Pre-Initial Coin Offering has conducted from 1st July 2018. Use 20% current discount and buy Ethx ICO by using Bitcoin, Ethereum, and Litecoin. From 1st August, users can buy and sell cryptocurrencies by using their Credit or Debit cards and also through bank transfers. Also planned to launch the Ethx DataBlock and Ninja for public use from 15th August and will start the Merchant services from October month. So the users can purchase by paying crypto coins. In January 2019, Ethx will be ready to record all the transactions of the ethx on the blockchain. ETHX: This is Ethereum based token which following ERC20 protocol and these are not mineable coins. At present, the cost of 1 ethx is 0.0005 ETH, 1 ethx is 0.00004 BTC, and 1 ethx is 0.0025 LTC. So, people can buy 2000 ethx coins by using 1 ETH. 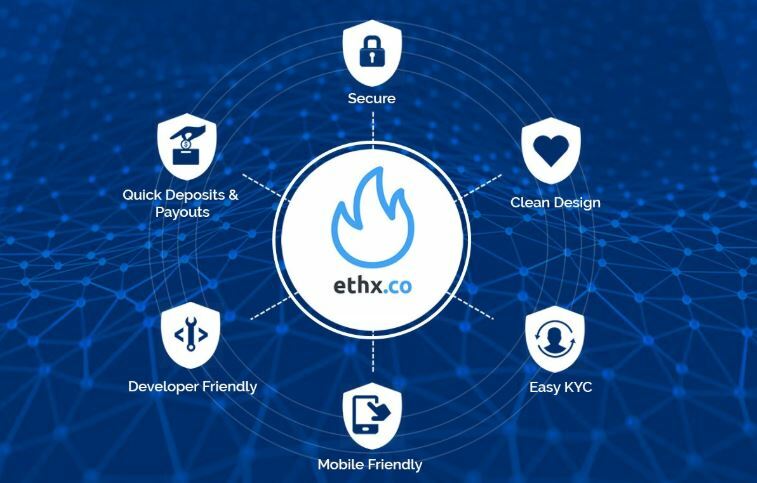 Click here and get 10 ethx coins instantly for free by creating an account and also get more by following steps given below. First Step: Deposit some amount to your ethx account and claim this badge. Wolf of Wallstreet: If you have over $1000 in assets, you can claim this 50 ETHX. Goblin: This is the next step from the previous badge that if you have $100000 in assets, then you can claim this badge which will give you 2500 ETHX immediately. Fan: Follow the official Twitter handle of ETHX to claim 1 ETHX as free. Love: Like the same as Twitter, follow the official Facebook page and claim one more free coin. Tweetheart: Click on Tweet about us and tweet it on your personal Twitter account to claim this badge. Ninja: Sign up on https://forum.ethx.co/ and help them to improve ethx by requesting feature to claim 50 ETHX for free. Influencer: If you have any blog or YouTube channel, they create a content about ethx and past the link in this badge to claim another 50 ETHX for free. Hacker: If you found any security loophole and mention it under Bugs tag in the ethx forum and claim 100 ETHX. NEO and SIA will be the next supported Cryptocurrencies on ethx.co after BTC, ETH, ETHX, and LTC. It has announced that the more coins will be added based on the user’s request and security clearance, blockchain scalability tests.